LibraryLil: Who is Library Lil? So my name isn't really Lil. It's also not Lilith, Lillian, Lily, or Lila. So where did the name come from? 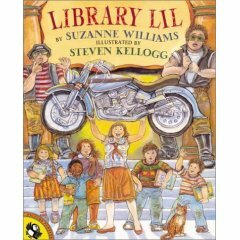 Library Lil is a picture book by Suzanne Williams, illustrated by Steven Kellogg. Lil is a very strong & spunky librarian. When I was looking for a name for this project and this blog, I chose Library Lil because it's a picture book and I'm a children's librarian, because it kept the word library in the title, and because I like the book. I won't tell you what happens in the book, but you can look for it and find out.